Caps Pre & Postgame Host Ben Raby previews the team's biggest challenge yet...the Tampa Bay Lightning. Why is Scott Campbell gone from the Skins? How do Tom Brady, Lebron James, Serena Williams and other "old" athletes keep it up? Jeff Bercovici shares details of his new book "Play On"
The Caps need a strong game-4 to show the Hurricanes they mean business. Peter Hassett of "Russian Machine Never Breaks" joins us to talk hockey...plus Redskins schedule, Tiger's Masters victory and is it time to seriously consider firing the Nats' manager? Caps/Hurricanes in Round 1 / Redskins On Hard Knocks? The Washington Capitals go into the playoffs in much the same fashion as last year...when they won it all. NBC Sports Washington's Brian McNally previews the Caps/Hurricanes series. We're waiting to learn about the NFL schedule, the Redskins' moves in the draft and whether HBO will roll its cameras into Richmond for Hard Knocks this summer. Co-host Jamal Bowens finally gets his wish...Wizards Team President Ernie Grunfeld is gone. 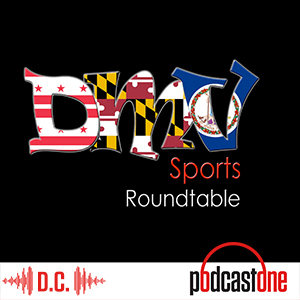 Wizards 24/7 Host Bryan Albin joins us with his take - plus predictions in the men's Final Four and Nats/Phillies with plenty of boos for Bryce's return to the nation's capital. Are the Redskins looking to get Dwayne Haskins in the draft? There are reports head coach Jay Gruden is being left out of key decisions. Which local teams will excel in the NCAA Men's Basketball Tournament? Dave Preston of WTOP Sports is our special guest. Are Nationals fans better off without Bryce? What do the Nats have going for them in 2019? What should the Redskins do in the draft? Local men's college hoops teams push for a piece of March Madness. Nationals Managing Principal Owner Mark Lerner tells NBC Sports Washington "We've moved on" from Bryce Harper. Senior Writer Todd Dybas joins us....plus Pats Owner Robert Kraft is charged with solicitation of prostitution. The NFL and QB Colin Kaepernick settle a case accusing the league of colluding to keep Kap off a team. The Wizards may not inspire much at the all-star break - and Bryce Harper in limbo. The Athletic's Tarik El-Bashir says he expects Redskins owner Dan Snyder to open his wallet and make a splash this off-season, as it looks highly unlikely QB Alex Smith will be ready to play.